Gibson and its various parent companies have used the Kalamazoo brand several times over the years. The best known and loved is the budget line by Chicago Musical Instruments, or CMI (Gibson's parent company during the 60s), and that's the line of guitar and bass amps this guide covers. But we'll touch on the others to help recognize any Kalamazoo branded guitars or amps you may run across. This early line was acoustic instruments only. In fact, it predated the invention of the electric guitar. It's not clear whether the WWII line was a budget line or not, but it was restricted to lap steels. 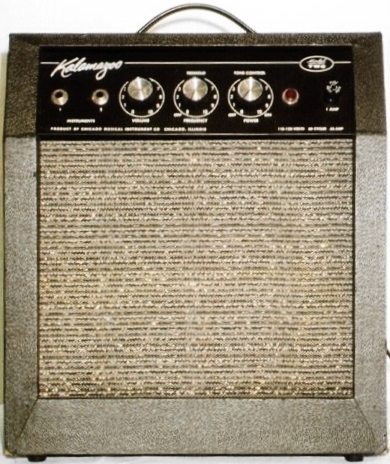 The Kalamazoo amps covered in this guide and best known by electric guitar and harp (harmonica) players are the ones made "twenty years later" - in the mid to late 1960s. Kalamazoo, MI, was the location of Gibson's manufacturing operations from Gibson's inception in the 1880s until the early 1970s; hence the Kalamazoo name. In their heyday (the mid-1960s), Kalamazoos were some of the best, small, tube amps around. They were never anywhere near as popular as Fenders, but were a great little amp for the price, and seem to have been of more consistent quality than many of the Gibson brand amps! The Kalamazoo Models One and Two were extremely similar to the tweed Fender Champ 5F1. Later on, they made some transistor models, the Model 3 and Model 4, which corresponded directly to the Model 1 and Model 2. They were OK, not great, not terrible - not bad for an inexpensive practice amp, but not something to spend much time hunting down, either. Bjorn doesn't have complete data on how many of each type of Kalamazoo were shipped, but he has data for the guitar amps. There's no breakdown available of blackface versus woody. The chassis is thin steel, but plenty strong for a practice amp, and they held up well on the road. The biggest problems are the cabinet, made of fabric covered particle board and the baffle, made of thin pressboard. Even these holds up well if the amp isn't abused too badly. But one good drop can ruin the baffle. Kalamazoos never had standby switches or ground switches. As noted below, the tubes were of excellent quality. Apparently Gibson cut costs primarily by not using wood for the cabinets, the thin, steel chassis, and getting rid of anything that wasn't absolutely necessary, not by scrimping on electronics component quality. Because of the time frame these were produced (mid-1960s), they all have two-conductor power cords. For safety's sake, these should be replaced with three wire power cords. At least one incarnation of the Gibson Skylark series had identical electronics to the Kalamazoo line. The GA-5 of that era was the same as a Kalamazoo Model One, and the GA-5T was the same as a Kalamazoo Model Two. But there were several other versions of the GA-5 series that had nothing in common with the Kalamazoos; one of these used two 6AQ5s instead of a single 6BQ5. A much rarer version has two 6BQ5s. The first GA-5 was the Les Paul model, essentially a Gibson Champ. All the Kalamazoo models labeled the volume control as "Loudness". This seems strange since today a loudness control usually enhances the bass frequences at lower volume settings, but in the 1960s this was not an uncommon usage of the term- even though many stereos at the time sported both volume and (bass boost) loudness controls. I haven't been able to find anything definitive on the tubes used in these amps, but I can say from careful observation and research that very good tubes were used in at least some of the amps. Some of the 12AX7s were CMI-rebranded Mullards. I have seen several of these, generally worn out, which attests to how much these amps were played. I have at least one of these still floating around the shop. Some of the 12AX7s may have been rebranded RCA gray plates. Certainly CMI rebranded these at some point, and I have seen one in an old Kalamazoo. All the original 6BQ5s I have personally seen were Raytheons, some rebranded as CMI. They may have used other tubes; I'm not sure. It's theoretically possible that everyone who claimed these were original tubes was wrong or lying, but (a) CMI definitely rebranded the above tubes, (b) the above tubes were in amps I own or have worked on, and (c) none of the owners was trying to claim the tubes were anything special-- just original. The prices for the amps I bought certainly didn't include the Magic Tube Tax! The Model One is a basic, 5 watt, no frills amp. It uses three tubes (6X4, 12AX7, 6BQ5), has a fairly decent CTS 10" speaker, and an output transformer a bit on the small side. Because it uses a single-ended output section, it is true Class A. The Model Two is a Model One with a tremolo. The tremolo has a frequency control, with an on/off switch attached to that control. It has no tremolo depth adjustment. Because of the circuit (the tremolo oscillator drives the second preamp stage cathode) the tremolo sound is a bit funky. At low speeds, the tremolo is extremely intense, and adds a bit of distortion. At top speed, the effect is less intense, but there is no noticeable distortion. In between, the effect is still fairly intense, with little to no distortion. You won't quite get a ``Crimson and Clover'' sound, but you can get close. The Kalamazoo 3 is a solid state (transistor) version of the Model 1. It appears to use an identical, 10" speaker. The clean sound is OK, but not great. The distortion is typical, cheap solid state distortion. It comes on suddenly, and is fairly buzzy. Whether it's a good distortion is a matter of taste. 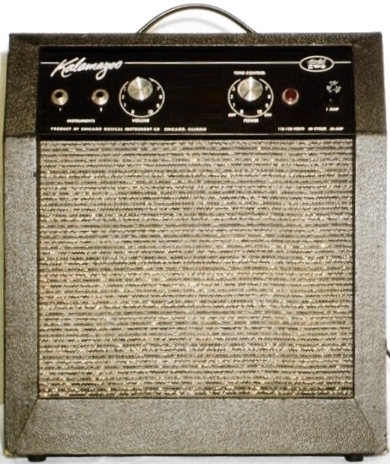 The Kalamazoo 4 is a solid state (transistor) version of the Model 2. It appears to use an identical, 10" speaker. The tone is identical to that of the Model 3. The Reverb 12 is a completely different beast; it uses a push-pull 6BQ5 output circuit with about 12 watts of power, driving a 12" speaker. It features reverb and a more standard tremolo configuration with speed and depth controls. It also features bass and treble controls, as opposed to just a tone control. This was apparently meant to be a Class A output stage. It can be rebiased for Class AB and more output if desired. The Reverb 12s tend to be a bit more problematic than the Model 1s and Model 2s. They're also noisier due to some build issues. The Bass 30 is a 30 watt bass combo with two 7591s in push-pull configuration, driving two Jensen C10P speakers in a sealed (plywood!) cabinet. The control panel folds up into the box, somewhat like a certain Ampeg, only smaller. It includes bass and treble controls. The Bass 50 is similar, but with 50 watts (two EL34s) and better speakers. The Bass model was usually a solid state model, power output unknown, although I have email from two, different people who say they own tube models marked simply "Bass" with no number. Depending on the guitar pickups and how hard you play, these are capable of some serious distortion, with a really nice clean sound as well. They have basic tone controls. The power switch is on the tone control. They're excellent practice amps, and of course work fine for gigging if you mike them. You'll probably want to replace the speaker (and most likely the output transformer). The Models 1 and 2 use one 6BQ5/EL84 in the output stage, generating about five watts (pure Class A), and the Reverb1 2 uses two 6BQ5/EL84 tubes in push pull, for 10-12 watts (Class A). These can be pretty loud, especially in a typical room at home. They could use a bit more bottom (they're just 10" speakers!) and a bit more top end (they're old, cheap 10" speakers!) Many of these have bad "safety caps" (nee "death caps") so playing barefoot isn't a good idea. Switching to a modern, grounded power cord and removing the death cap will solve that problem. Replacing and upgrading the power supply caps will help drop the hum levels a great deal. I gave my Model One to my son Josiah for Christmas right after he turned 12, along with a BC Rich ST Platinum I bought from a friend. Josiah promptly fried the OT trying to hook up a larger speaker (I'm not quite sure why I never blew any OTs in my youth - I learned by experimenting, too!) We replaced the output transformer with one from a Model Two, replaced some of the speaker wiring and the fuse holder (old cap was lost), and switched to a three-wire (grounded) power cord. The Model One's original tubes still sound really good. I have tried swapping some of the best tubes on the market today, and the old ones still sound best! (This amp doesn't push any of its tubes very hard.) I'm still thinking about a replacement speaker and a bigger OT, probably a Fender 8 ohm. With the Model Two, I really like the Sovtek 12AX7LPS for the preamp, the Japanese Raytheon NOS 6BQ5 or the JJ/Tesla 6BQ5, and a JAN 6X4WA rectifier. I'm running a cheap Chinese 12AX7 for the tremolo oscillator at the moment; I want to try a couple of other tubes here to see if they eliminate the low speed distortion. (You can read some tube comparisons at http://www.rru.com/~meo/Guitar/Tubes/. My Reverb 12 needed tubes, so I replaced those. 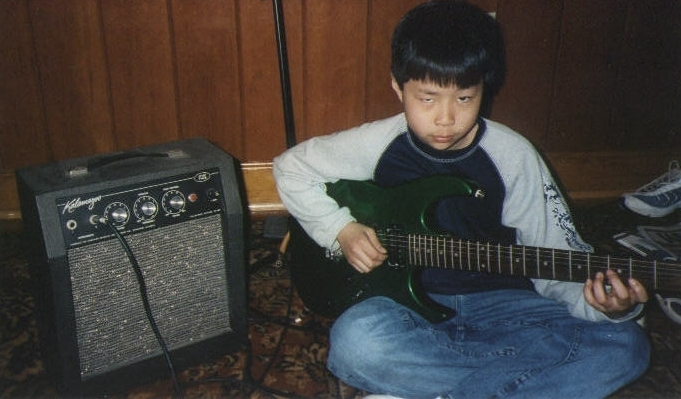 I then played the amp, starting quietly, gradually bringing it up. Supposedly it's been played all along, so I wasn't worried about the caps. It suddenly got quiet, then the lamp went out. A PS cap had shorted and taken the diodes with it before the fuse blew. New diodes, new caps (mostly), added a DC bias to the filament circuit to cut down on hum, and a new fuse, and back in business. Whoops, no footswitch. Shorting the trem jack, the trem is OK, not fantastic but certainly better than on the Model 2. The reverb pan's driver transducer seems to be shot. It's much quieter now, but I get a pop now and then while it's warming up; have to trace that down. It's not quite as loud as I'd hoped. It could use a bit more headroom. The distortion is pretty sweet, but overall the amp sounds just a bit more sterile than I like. I'm going to play with some more tubes before I mess with anything else. It'll produce a wide range of sounds, but definitely needs a better speaker before considering it for serious use outside the woodshed. This version of the tone circuit is not too common. This amp is based on what I have dubbed the "B" version schematic (simply because I got the other schematic first). This has a rather odd bass control that (1) has a severe knee in its response curve, and (b) runs the whole amp's volume up and down, much like a Fender's midrange control when the bass and treble are dimed. I'm probably going to convert the tone circuits to those of the "A" version, or maybe just a straight James or Baxandall circuit. OTOH, while the bass control is very sensitive around the knee, it can produce some killer tone. My SDS-1 equipped Hag can sound almost like it has humbuckers! With the p/u phase reverse switch tripped, it comes pretty close to a Molly Hatchet tone, which surprised me quite a bit. Maybe I'll keep this one pretty stock and play with the second Reverb 12 I bought. JJ Tesla 6BQ5s sound good in it, but the EH EL84s sound like they were built with this amp in mind. Any good preamp tubes will work fine. The Model 3 is your basic, solid state practice amp. It's in a slightly smaller cab than the Model 1 and Model 2, but appears to use the same speaker. The controls and inputs are reversed compared to its tube predecessor, the Model 1 - tone/on/off on the left, then volume, then inputs. The knobs are much smaller than those of the Model 1. Late 60s chic. It's not bad for a solid state practice amp. The clean tone is OK, but lacks highs at low volume, and is a bit shrill at high volumes. And it's fairly lifeless. As you get past half volume, it starts distorting, at least with modern, high output Dimarzios feeding it. At low distortion levels it's reminiscent of Credence Clearwater Revival's lighter distortion sound, but not quite that coherent. As the distortion increases, it gets horribly muddy, very quickly. I want to try a better speaker and see if that helps. It's not the brilliant amp its tube brethern can be, at least with the stock speaker. But if you can find one cheap, and are happy with solid state amps, you'll probably like it. The Model 4 is just like the Model 3, but with tremolo. Since they redesigned the cabs shortly after they switched to solid state, you can't easily retrofit Model 1 or 2 guts into a Model 3 or Model 4. The Bass 30 amp is really clean, even if you drive it hard. It's not all that loud, but it does sound sweet. The tone controls are a bit strange, at least with the volume up full (the only way I tend to play this). The treble control acts like you'd expect, but the bass control hits max bass somewhere around the middle, after which volume drops off slightly as you turn it to max. The two 10s in the sealed cab do a good job for both bass and guitar. Driving the input hard with a booster or distortion pedal pumps up the volume quote a bit. Besides the Kalamazoos, Gibson made plenty of amps under their own name (as chronicled by Bjorn Anger <ekabjan@hem.passagen.se> . Copyright Y2K, Y2K++,YK+7 Miles O'Neal, Austin, TX. All rights reserved. Kalamazoo Model 2 photo courtesy of Nick Schepis . Model 1 photo derived from Model 2 photo with GIMP. Photo of Model 2 being played by Tyler Cooper courtesy of Tyler's dad, Ira Cooper, who had his old amp fixed up for Tyler. Thanks to Joe McNamara for the lowdown on how Kalamazoo fit into the Gibson family, including the Tom Wheeler quote. Thanks to Bjorn Anger for the Carter quote and amp shipping information. Bjorn maintains the definitive Gibson tube amp website at http://hem.passagen.se/ekabjan/GibsonAmps.htm . Some Reverb 12 information courtesy of Antonio Salvatore and Jeff Caruso. Some Bass 30 information courtesy of Rick Sharp and Rob Murray. Some Model 2 photos and information (including speaker codes to prove CTS manufacture) courtesy of Steve Walker.